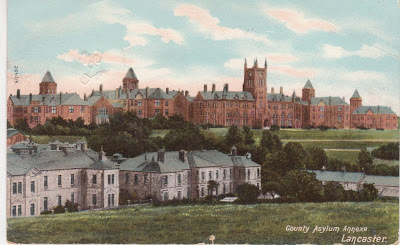 Opened in 1883, the buildings on this postcard are a familiar site from the M6. The large imposing buildings are Grade II listed and although empty for now will eventually be redeveloped for housing. I have been reading Alan Bennett's autobiographical book "Untold Stories." His mum was sent to one of the outbuildings suffering from depression - for assessment. At first the family was glad it was an annex and appeared to be on a smaller scale, but soon had misgivings and had her transferred elsewhere.